The Still Traveler | books, adventures, etc. : Grease: Live! The news that Fox was going to air a television version of one of the world’s beloved musical movies came to me late I guess, and even in an unusual way. I was scrolling my /boring/ facebook feed on Christmas morning but lo and behold, a friend of mine shared this promotion video of the stars of Grease: Live! Of course there was just one reaction to that: OH. MY. GOD. I divided this post into different categories so that it'll be easier for me to filter my thoughts. Because honestly, as of now, I just can't! Everything about this show is overwhelmingly awesome. The cast is stellar for all I need to know. I’ve loved most of the work the members of the cast have made before. I’ve had doubts on some of them, mostly because television singing isn't same as musical-live-television singing, but then, boom. The whole cast was so great altogether. Everyone shone through because everyone was working well. I think it's best to acknowledge that the whole show was great because everyone was working well together. One thing I noticed about the casting was that not everyone was very popular to audiences world wide. I doubt people didn't even remember that Aaron was in the Les Mis 2012 movie. Same with Carlos Penavega who was in Nickelodeon's Big Time Rush. Also, maybe some people were surprised with Keke Palmer and Carly Rae Jepsen, even though they were both clearly qualified to play their roles because they've had experience in Cinderella Musicals in Broadway. The cast was an equal balance. Just like how Grease's story was told, balancing the spotlights and storylines for every character, the actors in this show didn't outshine each other. They all shone because they complimented each other. That was legit chemistry. 1. To say that I loved loved loved Aaron Tveit as Danny Zuko is an understatement. I was looking forward to him playing this iconic character and he killed it. I missed hearing his lovely singing voice ( I kept saying that everytime he sang in this production, because it has been a while since I watched him sing) which I think gave his Danny a unique touch to it. I just loved it so bad. Ahhh, I'd give everything to hear him sing live. 2. Two actors I didn't expect to take away their roles were Vanessa Hudgens and Carly Rae Jepsen. I wasn't a fan of Vanessa's bad girl roles before but she did so well with Rizzo with the fierceness she gave away in the duration of this musical. Meanwhile, while I wasn't always convinced with Carly Rae especially since I've heard her sing and act in clips of the Cinderella musical, her quirky and adorable Frenchy spoke to me well, and that was all it needed for me to appreciate her performance. 3. Carlos Penavega's Kennickie wasn't expected at all. I was so used to seeing him in nice, derpy guy roles that I had to plant in my mind that he was indeed doing this badass role beside Vanessa Hudgens'. While I wasn't able to experience so much chemistry between them, Carlos did a great job being a Thunderbird. 1. Jordan Fisher (ft. Aaron Tveit)'s Those Magic Changes. That song killed me. Jordan's voice from start to end was lovely already, and then Aaron joined in before it ended and it just intensified my love for it even more. Also, may I just say, the funny thing is, I didn't realize that I've known Jordan before. I certainly didn't recognize him from his role in Disney's Liv and Maddie. Man, he deserved this part and he definitely deserves all the applause he is getting for this performance-- he shone through that whole sequence, and he was just so great. Hands down. I love him now and am willing to follow him. I can't hear you over the voices of two beautiful angels. 2. Summer Nights. Summer Nights was always my favorite song from Grease and this cast's version of it just took my breathe away. I was squealing the whole time-- especially with the really adorable performance/dance number they had. The nostalgia I felt from it was there, of course. And I guess that alone is enough for me to love it so much. That split screen was so much to take. The dance number that killed me and made me swoon so much. 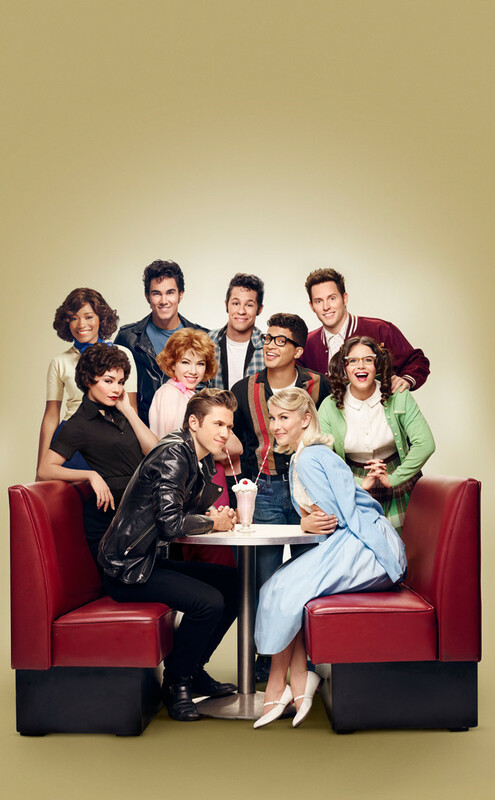 Grease: Live! was just a delightful way to introduce a piece of the 70s to today's generation. The bearing that a familiar yet talented and bright cast can do is so much to make the current generation fall in love with a gem from the 70s, and it is indeed so much to make the lovers of its original version fall in love with it all over again. I've always loved the original version because of its timeless story and uniqueness (kind of, lol u know what i mean), but man, Grease: Live! is definitely the Grease of 2016, and it raised the bar for TV musicals once more. just incase this whole post is not enough to convince you to watch it. * While the opinions in this post are mine, the photos, GIFs and videos were from sites like tumblr and youtube.